More than fifty years after its opening night, I Confess remains one of Hitchcock’s least popular films. Even upon its release, many believed the film did not live up to the standard Hitchcock set for himself with his acclaimed necrophilic drama Notorious (1946) and The 39 Steps (1935) which he directed at just 35 years old. In a 1953 review of I Confess for the New York Times, Bosley Crowther wrote that “Alfred Hitchcock’s famous talent for brewing a mood of fine suspense with clever direction and cutting is spent on a nigh suspenseless script.” Yet the critics weren’t the only ones disappointed. When asked about the film Hitchcock himself stated that “the final result was rather heavy-handed.” It is notable, however, that I Confess did manage to gain a small yet impassioned following in the years after its release, even becoming a favorite of the French New Wave, a group of filmmakers including Jacques Rivette and Jean-Luc Godard particularly interested in exploring existential themes. As Rivette and Godard likely noted, there is something about I Confess that troubles us. 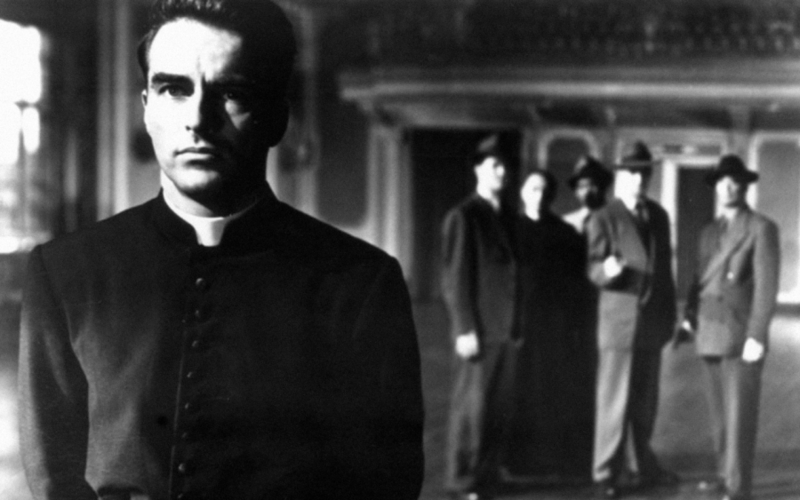 Our unease concerns the character of Father Logan, a Catholic priest burdened with his housekeeper Otto Keller’s confession of murder. Though he knows both the victim and perpetrator of the murder, Father Logan never calls the police, even when he himself becomes wrongfully accused. It is also quite strange, given the film’s crime-thriller premise, that the true killer is revealed in its opening minutes. Should we then agree with Crowther that the rest of the film loses all suspense? To attempt to understand Father Logan we must attempt to understand his silences. What is crucial about the priest, of course, is not what he does but what he chooses not to do, not what he says but what he refuses to say. Put simply, he is a character who must choose between his ethical duty to reveal the truth of the murder and his religious duty to conceal it. This dilemma is not specific to Logan. Under Roman Catholic law, it is forbidden for priests to disclose confessed information to civil authorities. In his Summa Theologica, Thomas Aquinas goes so far as to say that the ordained priest upon hearing a confession “knows it not as man but as God knows it.” Logan chooses to honor his religious duty. So on the topic of Keller’s guilt, Father Logan is silent. What is unique about Father Logan’s situation, therefore, is not that he must keep silent about a criminal confession. On this matter we may simply regard him as an abiding priest. What is unique about him is rather the extent to which his commitment to his duty, and by extension his faith, is tested. In fact, despite his status as a religious official steeped in the community, Logan is in many ways an alien in the film. He is doomed to be misunderstood by everyone, including the townspeople who become convinced that he is the one guilty of the murder. His silence also means that almost none of the other characters are aware that he is bound by the seal. And while we as the audience know that his silence is the result of his religious duty, we are left in the dark as to the nature of Logan’s personal relationship to his moral dilemma. Is he troubled by the ethical demand to reveal the killer? Or is he so strong in his faith that he does not begin to question his decision to conceal his knowledge? When asked about the murder, he remains expressionless, admitting to nothing. Almost always alone, he acts deliberately to draw attention away from Keller, even turning himself in at the station before the police arrest him on circumstantial evidence. His actions seem to suggest an untroubled conscience, but can we be so sure? He does, after all, hold Keller’s wife in his hands after she is shot by Keller, the very man he could have put way. He must watch his former love interest grow increasingly distraught over the proceedings of his arrest and trial. He must confront his town turned violent mob outside the courthouse. What does he feel in these moments? Should it matter to us? In the film’s final scene, Keller is shot by a police officer in the grand ballroom of the Chateau Frontenac. As he dies, Logan holds him in his arms and recites the words that will absolve him of his sins. Logan’s are the last words we hear in this film in which his silence was so central. And what are we to make of such an ending? By never giving away Keller’s confession, Logan has remained faithful in his duty to the infinite. His conscience has not bowed under the social demands of the ethical. Yet as an audience confronted with this final scene – the opulence of its setting and the serenity with which Logan speaks his final words – we are left to wonder what if anything, in the finite world, has been resolved? The police finally know the true murderer, but he is dead. His identity is revealed, but he cannot be punished. The town will have no opportunity to despise him as they now despise Father Logan. Father Logan, now exonerated, must return to work as an unloved and disrespected priest. Whatever saving grace will reward his silence belongs exclusively to the infinite. In the finite world, he remains a man whose decision to conceal Keller’s guilt has resulted not only in Keller’s death but also in the untimely death of Keller’s innocent wife. Nothing, it seems, is truly resolved in the end of I Confess. Yet this lack of resolution is what makes the film so powerful. As an audience, we are left to judge Father Logan for ourselves. And in making our decision, we are implicated in the drama of his dilemma. Safwan Katib is a first year in Columbia College. He is a member of the Editorial Board of The Columbia Review.